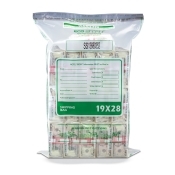 Budco provides a full line of FedCash compliant currency shipment bags that have been tested and approved by the Federal Reserve. Our in-line STAT security seal is the industry standard for currency shipping bags. The wide adhesive provides a tamper evident closure on both the inside and outside of the bag. Red, fracturing adhesive provides clear, visual evidence of tampering. Multiple bar codes are fully compliant with new FedCash Services requirements. Meets all new standard deposit packaging requirements for Fed Cash Services. All currency bags are 5 mil in thickness.